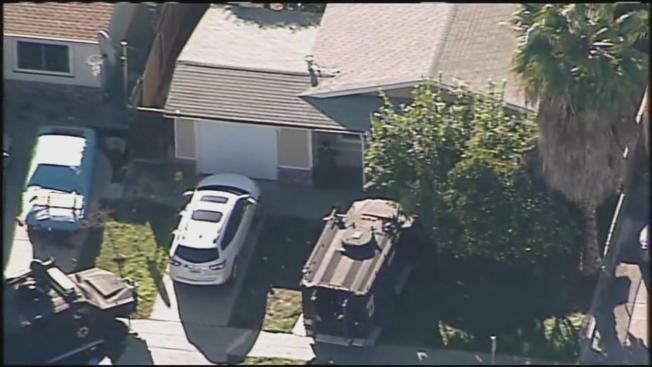 Authorities say Santa Clara County Sheriff's Office deputies were unable to find an escaped inmate after a SWAT team surrounded an east San Jose home. Sheriff's spokesman Sgt. Rich Glennon said deputies on Tuesday conducted several pre-planned operations throughout Santa Clara County after receiving tips of the possible location of fugitive inmate Rogelio Chavez. The search at the home on Inman Way lasted more than an hour, and SWAT officers could be seen leaving the scene around 2 p.m. Nearby Overfelt High School was reportedly placed on lockdown, sheriff's officials said. Katherine R. Smith Elementary School was also on lockdown, which was lifted at around 1:30 p.m., a person who answered the phone at the school said. Sheriff's deputies are still looking for two inmates who made a daring escape from Santa Clara County Main Jail on Thanksgiving Eve, using bedsheets to repel down their second-story jail cell window. As early as Sunday they had swarmed around a Gilroy Day's Inn after numerous tips led them to believe one of the inmates, 33-year-old Rogelio Chavez of San Jose, had been staying there. But he was nowhere to be found. Sources told NBC Bay Area that he left shortly before the raid. Sheriff's deputies did take two women and one man into custody during the raid. They arrested one of the women, Emily Vaca of San Jose, for "aiding and abetting" Chavez. Chavez stands about six feet tall, weighs 190 pounds and has the letter B tattooed on the left side of his neck. He also has a line tattooed over his left eye. Glennon said he was held since Aug. 17 on various charges including burglary, extortion, false imprisonment, resisting arrest, and firearms violations. The second escapee is 26-year-old Laron Desean Campbell. He is about six feet four inches tall and weighs 210 pounds. Campbell was held since February 2015 on various charges including robbery, false imprisonment, criminal threats and firearms violations, records indicate. The sheriff's office is offering a $20,000 reward for information in helping capture the escapees.